Another piece of artwork sent over by Les, this time featuring the Hillman Minx, and again an advert that probably went on to be used in a period literature in the late 1950s or early 1960s (probably the latter). As with so many manufacturers in the 1950s and 1960s, Rootes Group, who produced the Minx model, used the same basic design and created a number of niche products from those underpinnings. For example, the Singer Gazelle, 2 door Sunbeam Rapier, Hillman Husky estate car, and Commer Cob van, can all trace some of their basic design elements to the Minx. This approach allowed the car manufacturer to produce a varied line-up of makes and models, whilst keeping the tooling costs quite low (relative to producing completely new cars). This advertisement, which probably dates to 1959/1960ish, shows a beaming young lady, gazing upwards at hubby driving towards her in their shiny new, two tone, Series Minx. It would be a comfortably-off British buyer that could buy his good lady a new car for Christmas, then, as now. Reliability and longevity are emphasised in the advertising copy, along with "top-performance, top-safety and top-comfort". 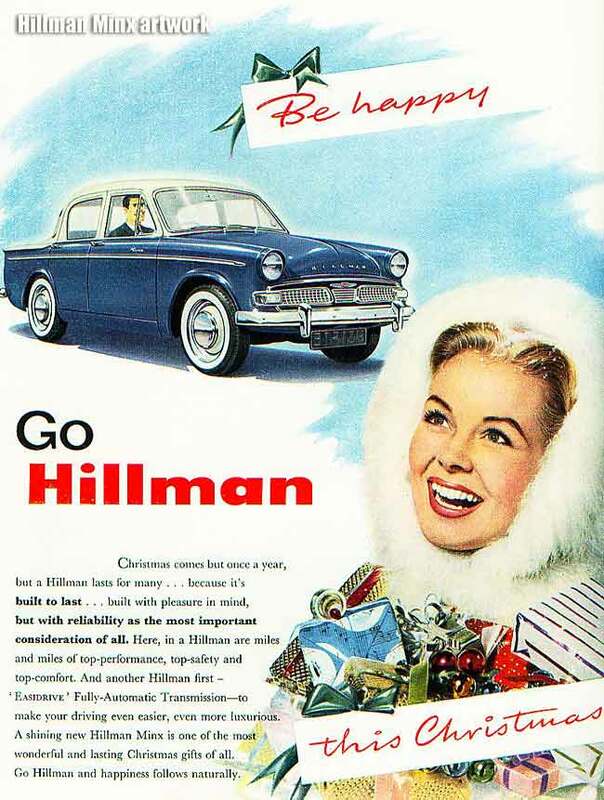 Easidrive automatic transmission also gets a mention, as does the gentle suggestion that ".. A shining new Hillman Minx is one of the most wonderful and lasting Christmas gifts of all. Go Hillman and happiness follows naturally.". So there you have it, forget nylons and a box of Milk Tray, to really impress your beloved, only a 2 tone Hillman would do the job!